Soft, sweet and chewy with that freshly oven baked, melt in the mouth cookie taste and ready in just minutes! 2. In a bowl whisk the almond flour, coconut, baking powder and salt. 3. Make a well in the center of the bowl and pour in the melted coconut oil, honey and vanilla extract, mixing together with the dry ingredients until the mixture is nice and thick. 4. Fold in the chocolate chips before rolling the mixture into approximately 8-9 balls. 5. Place the balls onto the baking tray and bake in the oven for 10 minutes before taking out and leaving to cool. 6. To make the milkshake, place the strawberries in a bowl and mash with a fork until they are of a chunky jam/puree consistency. 7. Add the agave, stirring well. 8. Place in a glass or jar and add the milk. Stir/shake to evenly distribute the strawberry sauce. 9. 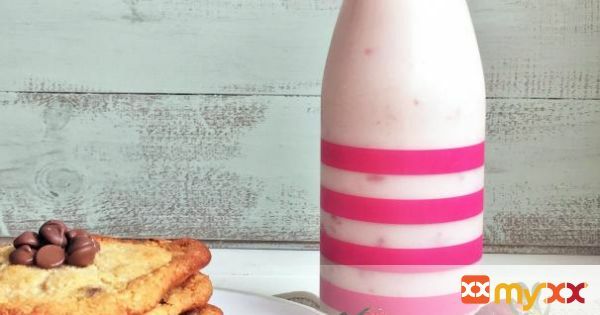 Once cooled, (you could place them in the fridge to cool further if you want), enjoy these sweet cooconut and chocolate chip cookies along with the cool, creamy milkshake.